Impressive technology. The BMW Cruise M-Bike combines a striking colour concept inspired by the BMW M series and high-quality technical components. 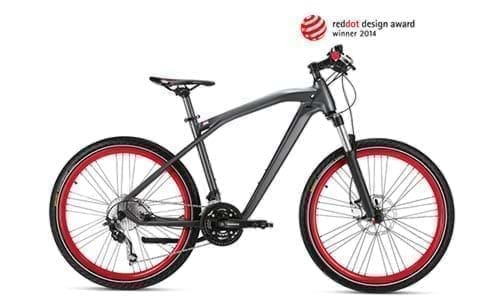 The hydro-formed frame and carbon elements, which make the bicycle light and strong at the same time, together ensure a unique riding feel. Additional comfort is provided by the stabilising handlebar concept and the front-sprung fork with locking system. The hydraulic disc brakes from Shimano enable precise braking even on long descents and in any weather situation. IMPORTANT: Brakes are manufactured according to EU specifications. Fork: SR Suntour XCR RL-R.